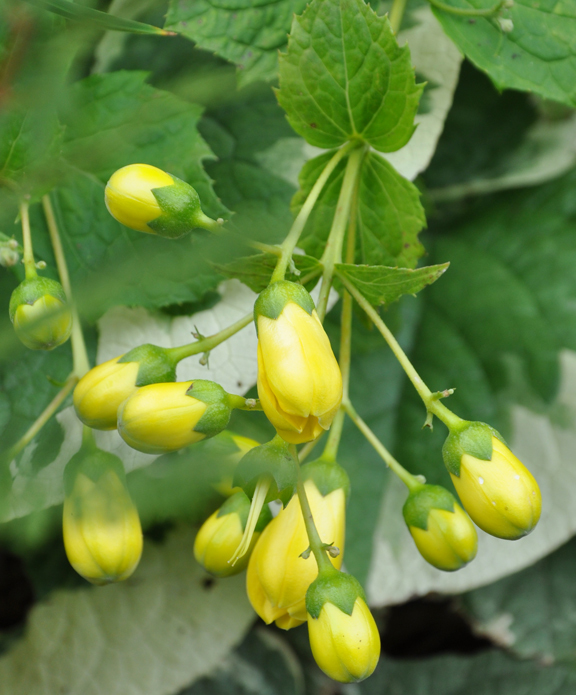 Soft, butter-yellow flowers in early September are a great reason to grow Yellow Wax Bells, Kirengeshoma palmata. Initially, the flowers look a little like clusters of fat, round yellow berries. As they mature, the blooms elongate into a tubular, almost bell-like shape (hence the common name). Once they are spent, the flowers are replaced with curious looking, three-horned, brownish-green seed pods. 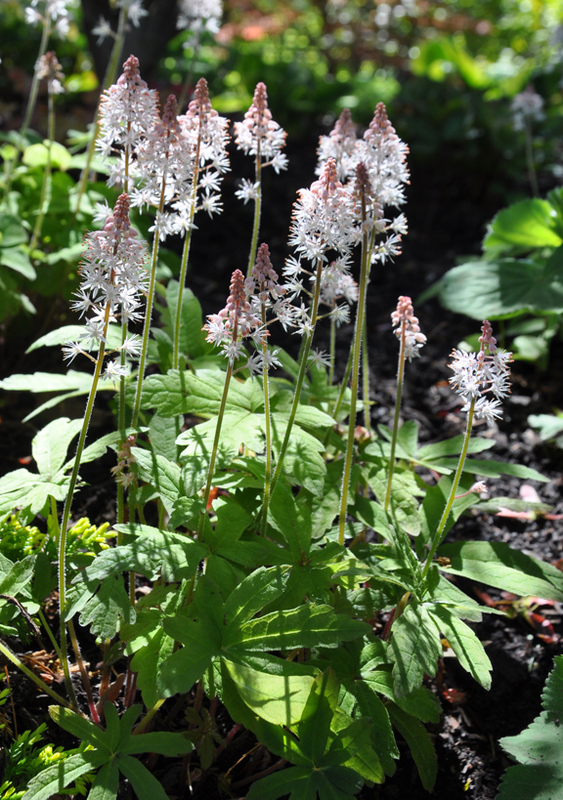 This woodland perennial, native to the mountains of Japan and Korea, has stiff, upright stems and the round shape and proportions of a small shrub (fairly similar in size and shape to a common Spirea). 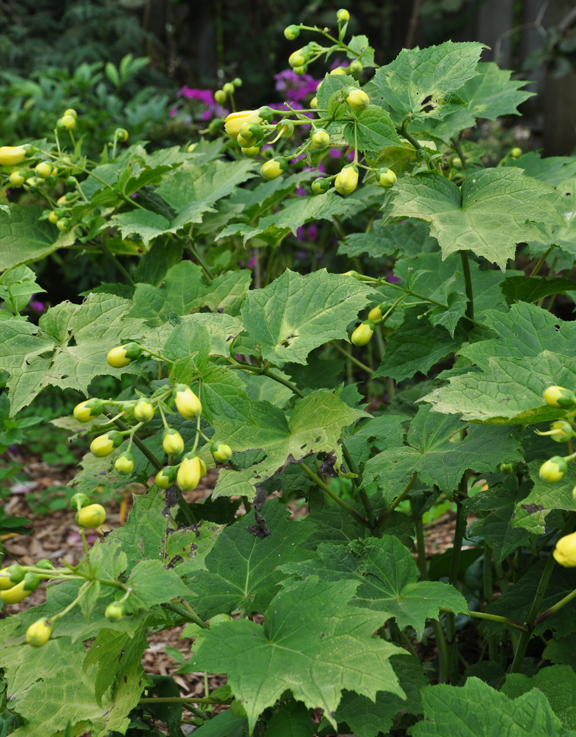 Yellow Wax Bells, Kirengeshoma palmata is a great foliage plant for moist, part-shade. It has pendulous butter-yellow flowers and medium green foliage that is shaped like a maple leaf. Height: 90-120 cm (35-47 inches), Spread: 75-90 cm (29-35 inches). USDA zones: 5-8. 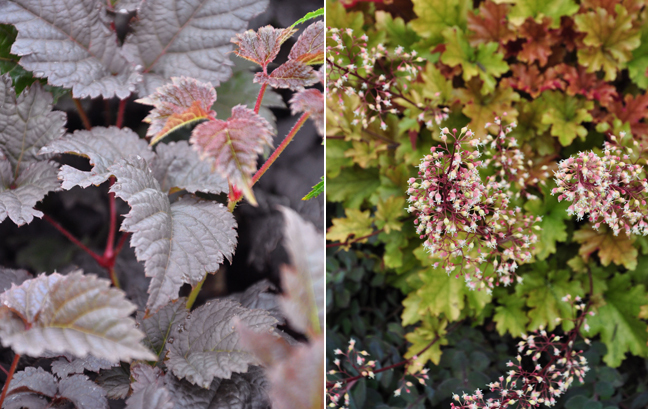 The attractive foliage is yet another reason to grow this plant. The large, medium-green leaves are coarsely toothed and deeply lobed. 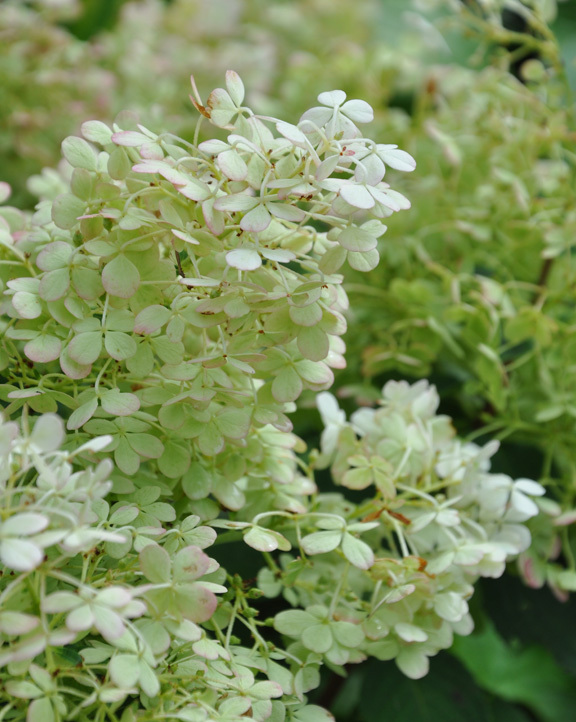 Wax bells are members of the Hydrangeaceae family, so not surprisingly, the foliage closely resembles that of an Oakleaf hydrangea. As you can see from my photo, this plant is not immune to insect damage. Slugs and snails can be an issue. One other issue with regard to the foliage is the danger of a sudden and unexpected dip in the temperature in the early spring. The emerging leaves can be blackened by a surprise frost. If this happens, you can cut the foliage back to the ground and your Wax Bells will recover. I prefer to cover my plant at night if there is a frost warning. The heavy blooms of this perennial hang down making it advantageous to plant Wax Bells where they can be viewed on an upward angle. This is a lesson I learned the hard way! Originally I had them planted behind some shorter perennials and the flowers were entirely lost from view. So this spring, I moved my Wax Bells to a new hillside location where they overlook what will be a small waterfall and stream in the very near future. In terms of light, my Wax Bells are planted on the outer edge of a tree canopy. They get a little sun in the morning and then they are in bright shade for the remainder of the day. To make Yellow Wax Bells truly happy, you really need moist, rich soil. If your growing conditions are on the dry side, as they are in my garden, be prepared to water your plant regularly. A run of dry weather and the foliage of my Wax Bells sulks miserably. 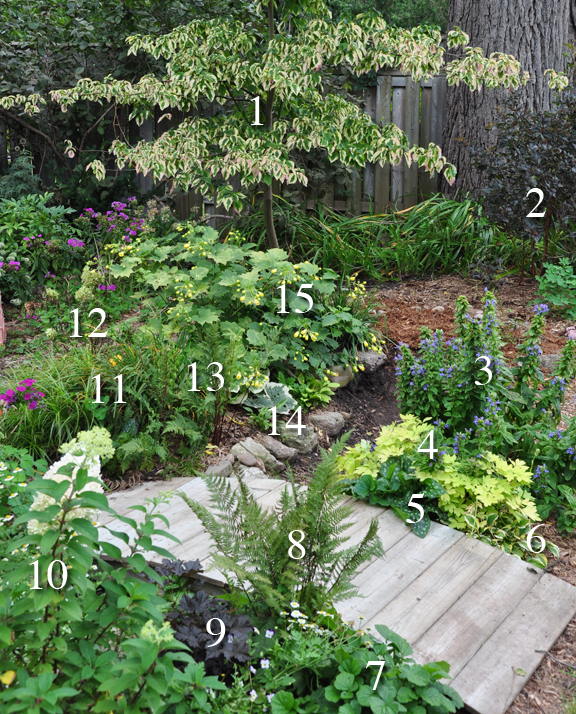 A top dressing of mulch helps to a degree, but I find supplemental water is necessary in the hot, dry weather of mid-summer. 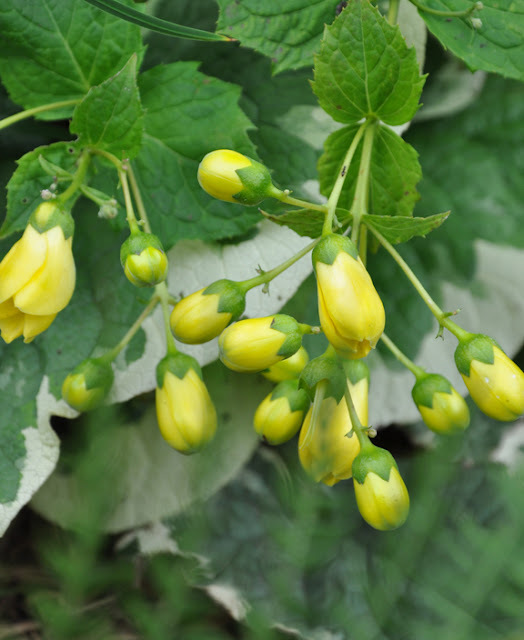 Yellow Wax Bells work with any woodland plant, perennial or bulb that likes moist, part-shade. 1. Dogwood tree 2. Ninebark shrub 3. 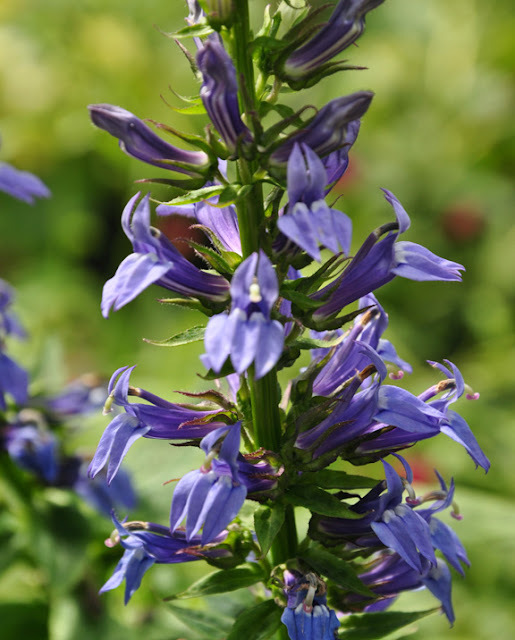 Great Blue Lobelia (Lobelia siphilitica) 4. 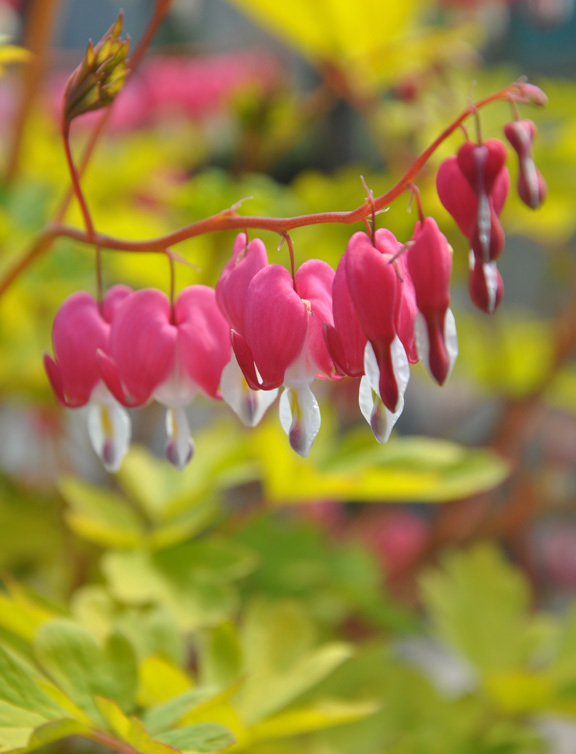 Bleeding Heart (Dicentra spectabilis 'Gold Heart') 5. Self-seeded Pulmonaria 6. Miniature Hosta 7. Geum 8. 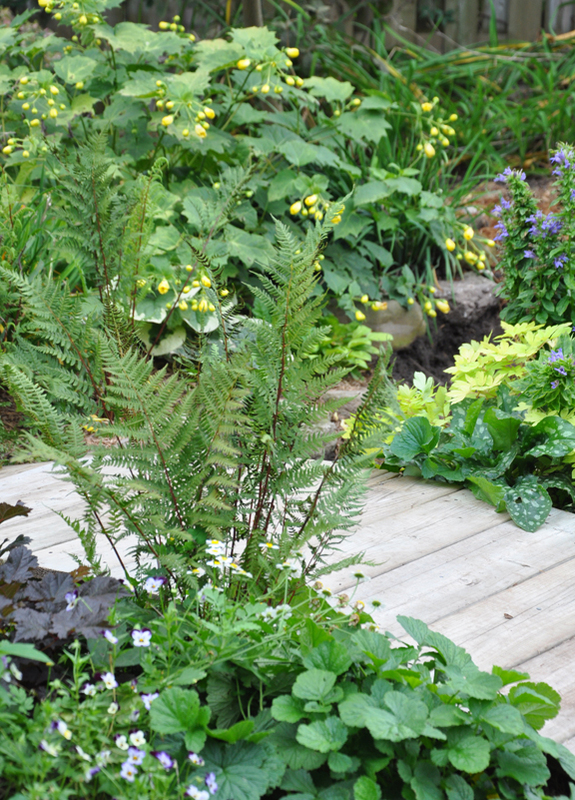 Lady Fern (Athyrium filix-femina) 9. 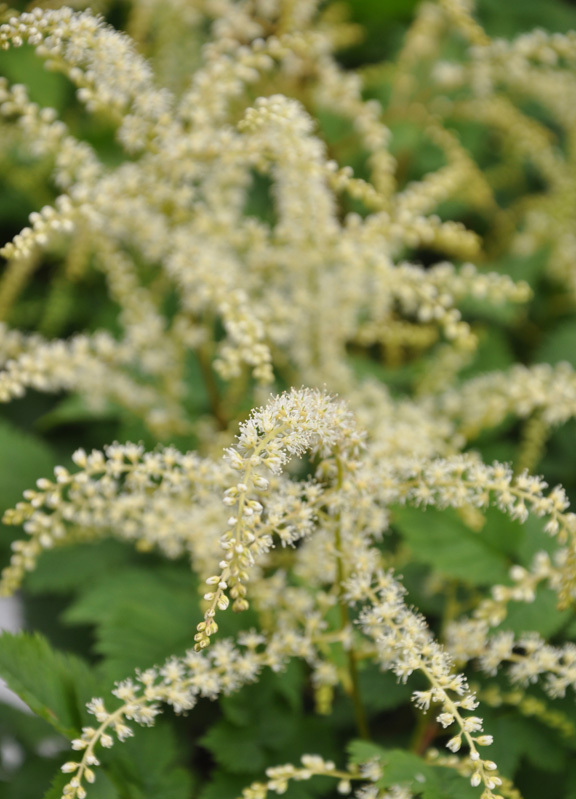 Astilbe 'Chocolate Shogun' 10. Hydrangea paniculata 'Bobo' 11. Carex 12. Hydrangea Paniculata 'Little Lime' (that I just about killed when I forgot to water it during one of the recent dry spells!) 13. Repeated Lady Fern (Athyrium filix-femina) 14. Brunnera (with a couple of miniature hosta at its feet that will eventually need to be moved.) 15. 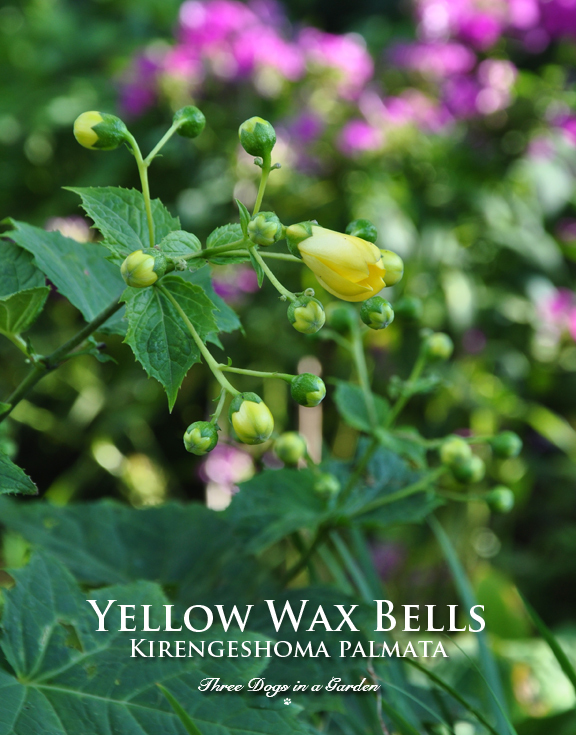 Yellow Wax Bells (Kirengeshoma palmata). The purple flowers (not numbered) are Phlox 'Purple Flame'. Piper on the second bridge swishing the Eupatorium 'Chocolate' with his tail. into shades of cream and rose. You may have to do a little searching to find Yellow Wax Bells, but I think you'll find that they are well worth the hunt (P.S. A local source would be Lost Horizons just outside of Acton)! 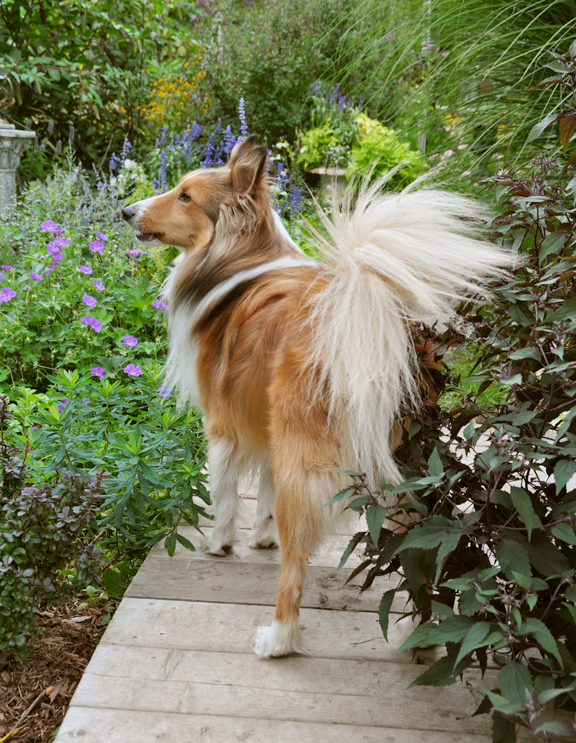 As a new subscriber to your blog Jennifer I am really enjoying your garden insights and beautiful pictures (doggies too!) 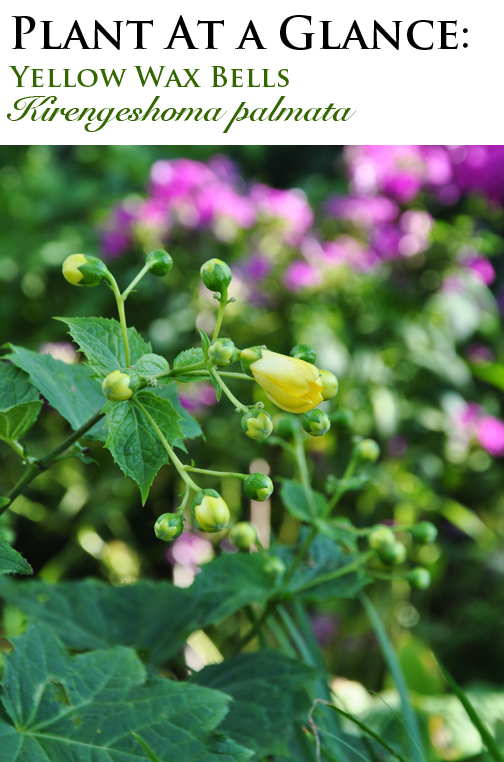 I garden in Calgary, Alberta (zone 4) and have grown Yellow Wax Bells for several years. Hands down, the loveliest of yellow flowers! This year, the heat and drought have taken a toll on them. I plan on moving three clumps scattered around the garden, into one group to better look after watering them. Thanks for bringing this beautiful plant into focus! Lovely plant, I had it once but obviously didn't look after it properly! Must try again. 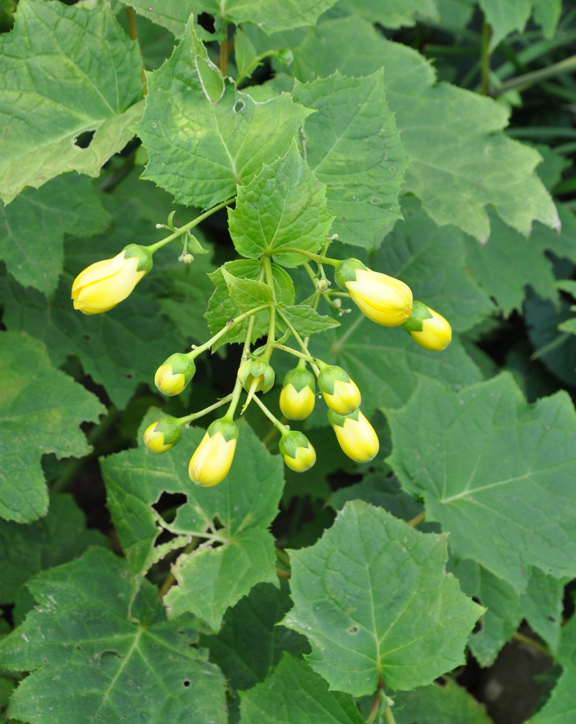 Excellent post on Kirengeshoma, so well detailed with suitable companion plants. We had this shrub in Aberdeen. I've always loved this plant. My last garden, which was destroyed and removed by the new owners, was too dry. My new one is moister so I may be able to add these.